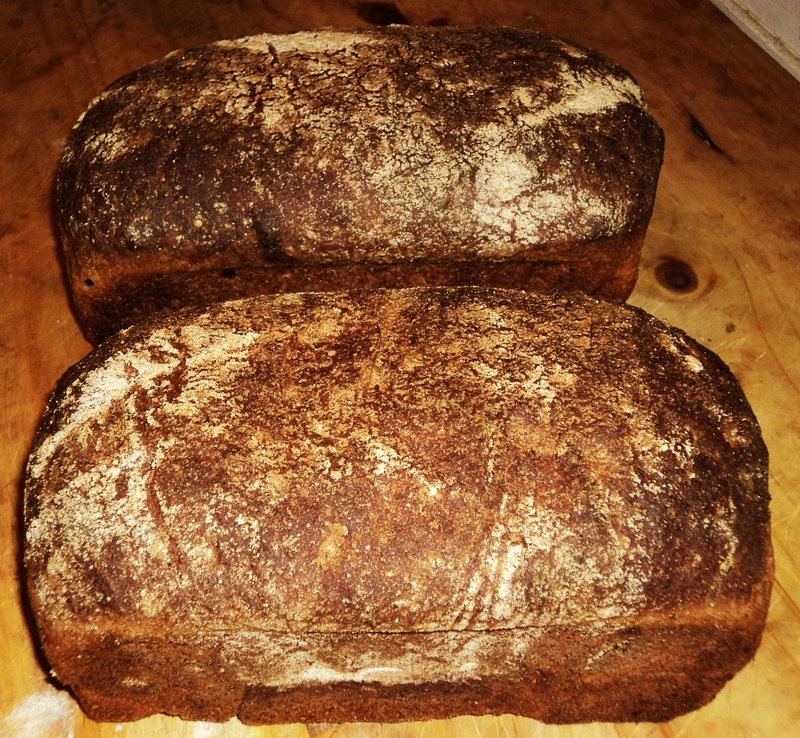 Regular visitors to this blog know that I like to make my own 100% whole wheat bread, but also that Ezekiel Bread is my favorite (and though I don't currently have data to back this up, I am convinced this is the most nutritious bread there is). I haven't posted the recipe in a while so thought I would for a couple reasons. The first, simply, is that I like it. And the second is that when talking to people (or if they taste the bread) they tell me the bread looks or tastes really good but the recipe seems complicated. Well I'm here to let you in on a little secret...it's not. The only difference between this bread (or any other bread that contains whole boiled grain) is that the beans and grain are boiled before being added to the recipe. Anyhow, this is how I made Ezekiel bread today (pictured above) without letting it interrupt my life...rather, I controlled it so that the various stages worked around my time today (the recipe is at the bottom of this post). This morning, shortly after lighting a fire in the wood-burning stove, I boiled some beans and grains. 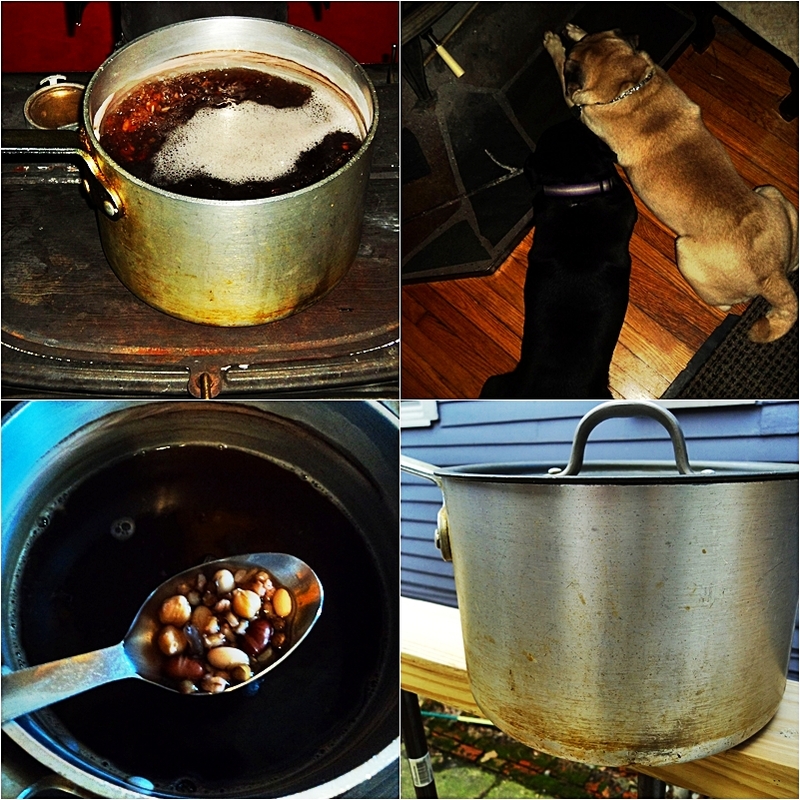 I don't often use the wood-burning stove to cook on that often--in fact I haven't used it as often as usual for heat because of the mild winter--but today I did, and the boiling grain made the house smell great (my two pugs loved it...that's them below sleeping next to the stove). And over the years my view of this recipe--or more specifically, my view of the beans and grains involved--are on the same line with my view of theology...extremely liberal (to read more about my liberal views of this bread, click here). Today, for example, I didn't have millet or bulgur but did have brown rice and chick peas so I used them instead...nearly any bean or grain will do (but not to worry, the recipe listed below is tried and tested...and it works). Anyhow, while I had my coffee, checked emails, Facebook, and updated this blog...the beans and grains boiled. When they were done I placed them outside on a rear porch railing to cool (it was only 32F/0C...why tax my fridge). And while it cooled I went and did a few errands on my bike, stopped at a coffee shop, and took a few photos. When I returned the beans and liquid were cool, so I mixed the two separate bowls (see recipe below) and went for a walk and to a health club for a quick swim. 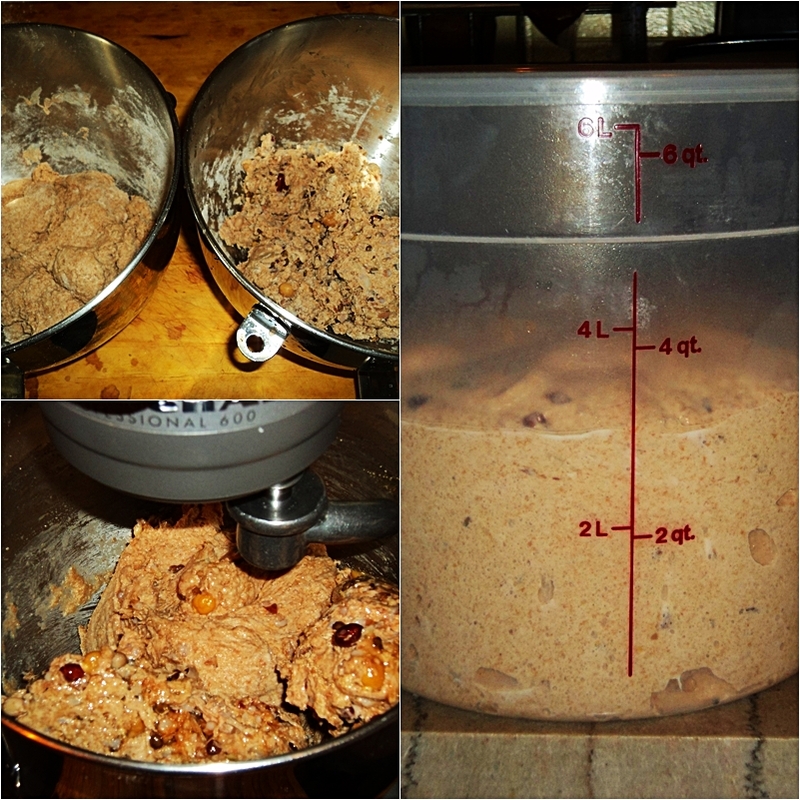 When I returned I mixed the dough, had dinner, then "went to my inner room" for a few minutes of meditation. After the dough rose I went to a local tavern for a couple beers, but before I did I shaped the loaves and put them in their loaf pans. And just before I left the house I turned on my oven to preheat it (my 20-year-old oven takes a long time to heat). When I returned home the bread was risen and oven hot so, after spraying both the bread and oven with water, I placed it in the oven. While the bread baked I wrote the previous post, pet my dogs, and had a glass of wine. And now, as I type these words, the rear of the house is warm--because the oven was on--the entire house has the awesome aroma of freshly baked bread, and I have two loaves of really good Ezekiel bread that cost pennies to make (compared to dollars at the local co-op for a sometimes mediocre loaf). I'll freeze one loaf and slice into the other for toast in the morning...but actually, I think I'll go grab a slice right now with butter on it while it's still fresh and warm. 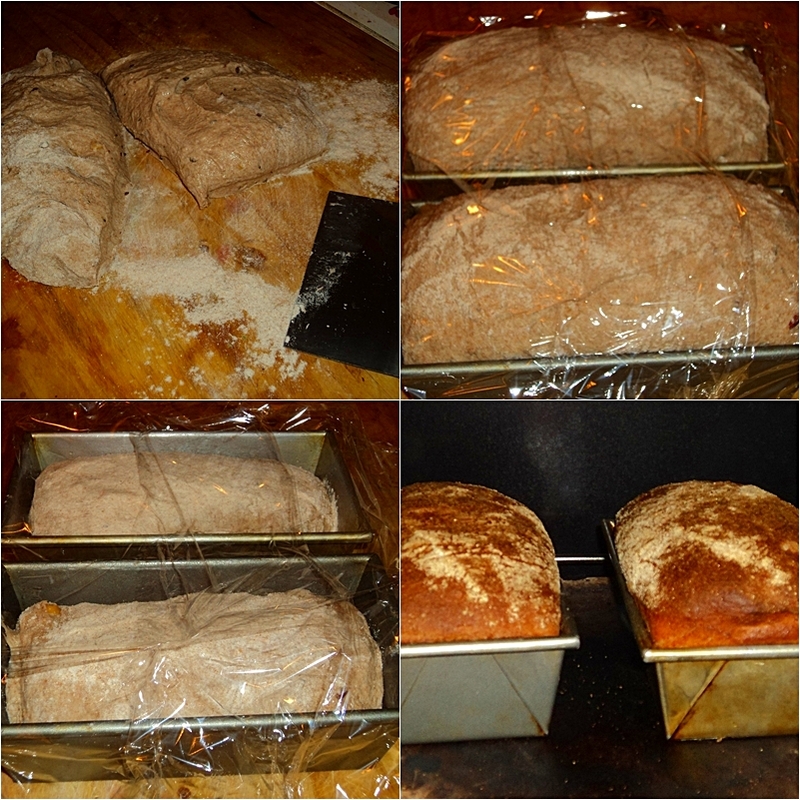 To read more about Ezekiel Bread and with more explicit photos, click here or here (but please use the below recipe as it is the revised version). I stumbled across your blog in my search for Ezekiel Bread recipes. I had tried a recipe from another site and did not like how it turned out sweet and crumbly. Your recipe is perfect for toast or sandwiches. I have been looking for an E.B. recipe that could be used for an "everyday" type of bread. I also read through the previous version of this recipe and some of your other bread posts. I don't remember which post, but I loved the idea of using the bread for pizza dough. Since there are just two in my household, I made 6 personal pan pizza crusts and 8 mini loaves of bread, instead of 2 "regular" loaves. I just tried a slice and it is exactly what I have been looking for. Thank you for your wonderful recipe. It will be a regular item in my household. I am also going to try other recipes you have posted. Dianna, Thank you for your kind words and also for making the recipe. Yes, Ezekiel bread is still my favorite bread....delicious and nutritious. And it does make great pizza dough as well. Thanks again for visiting. Peace. The recipe says 3 tsp of instant yeast. When I read through the instructions though, it says to add 2 tsp of instant yeast in the preferment bowl. Then later, in a mixing bowl add 3 tsp of instant yeast (on the opposite side of the bowl as the salt). I love the idea of this recipe and it looks so much better than everything else I have seen...but I need to know...is it 5 tsp total yeast (2 in the preferment and 3 in the dough hook bowl) or 3 (2 in the preferment and 1 in the dough hook bowl). Please let me know. Anonymous, Thanks for visiting. It is a total of 5 teaspoons yeast as the recipe states. While it looks complicated, it really is not. Read through it and break down the steps. Let me know how it comes out! I am not sure if this post is still active but I will give it a try. I live in a country where I cannot find wheat gluten (no gluten at all acctually). I know there is no substitute for wheat gluten so do I skip the gluten? Anatomy of the Shadow...haha, thank you. I am glad that my blog projects that image to you. What I usually do not mention is that I work more than full-time (often more than one job) and am taking 8 credits a semester right now. This equates to nearly zero social life. Though I still try to enjoy the everyday things in the moment such as petting my dogs, sipping wine, and baking bread. Thank you for visiting.